Last night's episode of Downton Abbey did indeed focus on the wounded residing at Downton and reminded us that it's those scars that we cannot see that often go the deepest. It's frayed nerves and broken hearts all around as the great house is turned into a convalescent home for those wounded in the war. The turn of events has given cousin Isobel her chance to try to take over Downton from the good hearted Granthams --- but not so fast! 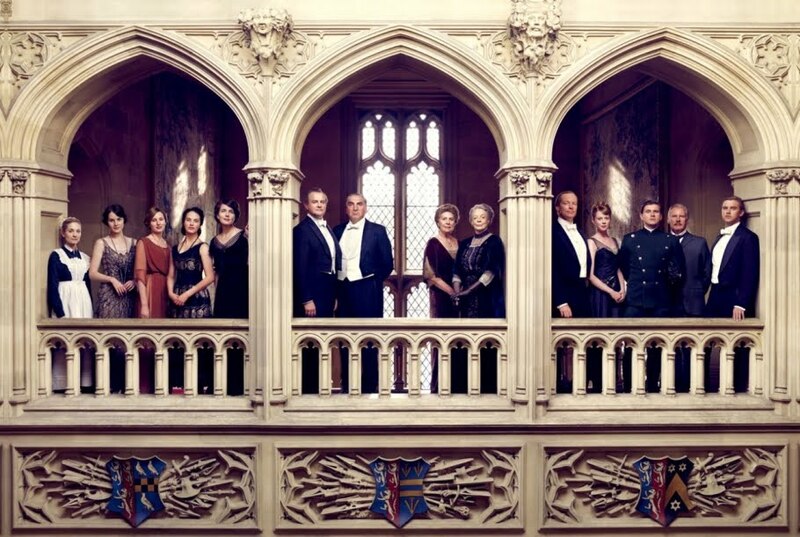 It seems the other war that is brewing has Lord and Lady Grantham (Hugh Bonneville and Elizabeth McGovern who continue to be entirely convincing as a long married couple whose love keeps them going through it all )trying to hold their ground while Isobel asserts her conveniently self-appointed authority. While Lord Grantham grapples with the idea of his beloved library being turned into a rec room (Who ordered the pool table?!? ), Cora finds herself having to reassert her authority -- in front of the staff, no less -- as lady of the house. This horrifies the staff none of whom are keen to take orders from a distant Grantham cousin. Cora's greatest ally in this battle of wills is O'Brien, whose loyalty is now clearly fueled by the guilt she feels over causing the Lady's miscarriage over a mistaken belief that she was to be replaced. O'Brien shares none of this with Thomas, who is suspicious of his enabler's fierce protectiveness for the woman she had so disliked before, ("What's in it for you? ")but, as usual, his own self-interests is enough for him to go along with whatever scheme O'Brien cooks up. When O'Brien convinces Lady Grantham that by assigning Thomas, a former staffer with medical training, to act as manager of the hospital, she'll retain the control of the house, Cora jumps at the idea. With a few convenient strings pulled, Thomas arrives --and comes through the front door! -- much to Mr. Carson's dismay. But Thomas pulls ranks -- "It's Seargent Barrow!" and with just like that, he's back in the fold. Much of the episode devoted to the turf war was amusing, but I hope it doesn't take over. This plotline has Isobel morphing into an increasingly annoying and unlikable character. As Matthew put it: "Dear Mother does love a bit of authority." As for the Grantham's daughters, Lady Sybil, fully immersed in her new passion as a nurse looking very Florence Nightingale in her starched white apron, proves somewhat of an inspiration to Lady Edith. Find something you're good at and go do it, the suddenly sensible youngest Grantham tells Edith. "It's doing nothing that is the enemy" says Sybil. Tired of being the odd woman out, Edith finds bringing touches of kindness to the recovering men is rewarding and gets a surprising acknowledgment for her work -- a champagne toast from a general no less -- leaving everyone (but Isobel)suitably impressed. Lady Mary has become a much nicer person since breaking up with Matthew. While it makes for an interesting storyline, it doesn't really connect with what we knew of her before, but it's kept the story moving along. In the last episode, Lady Rosamund overheard Richard Carlisle (a long lost Murdoch cousin?) threatening Livinia and smelled blood. Last night, the Dowager Countess and Lady Rosamund continue to plot to get rid of Livinia determined to find out what damaging bit of information they could unearth to banish her from Downton and replace Mary as the rightful heir to Matthew's affections. "Livinia is an obstacle to your happiness and must be removed" Violet tells Mary but the suddenly sainted Mary will not hear of it. (My favorite line of the episode) Besides, Mary tells her grandmother, there is no guarantee that if Matthew and Livinia end their engagement he will once again propose to her. Violet, never one to take no for an answer, tells her she's taking care of one problem at a time. The big secret about Livina turned out to be a bit of a snoozer. It turns out that Livinia's uncle, the government's liberal minister, was involved in a stock trading scandal (zzzzzzzzzzzz) and Livinia stole the evidence to and gave it to Richard Carlisle to protect her father who owed Carlisle a large sum of money. In learning that Livinia's pilfered government secrets (but not knowing why), Violet and Rosamund also decide that Lavinia and Richard must be lovers as well. That would make this subplot a lot more exciting but turns out, according to Livinia, not to be true. Armed with the news of the theft of information, Mary does not tell Matthew but rather goes to Livinia and asks her about it. Big surprise: Livinia does her best delicate flower act (I don't buy it) and says, yes, she did it to protect her father. Mary understands all too well what it means to do whatever it takes to protect your family so she drops the whole thing wasting about ten minutes of valuable episode time that could have been devoted to the lush scenery of the grounds that we've been hankering for. Matthew turns up on his way to the northern provinces and charms Mary once again with his wry observations about their mothers' turf war over Downton. Several looks across crowded rooms are exchanged. When he departs, he lovingly kisses his fiance good-bye and gives Mary a farewell akin to 'Cheerio, old chap.' Ouch. The most interesting things happening in the episode took place among the servants who seem to have a much better grasp on the concept that the world is in fact changing and their lives changing with it. Anna, on a trip to the village, thinks she sees Bates. When she tells Lady Mary of this, Mary tells her Richard can find out anything about anyone (how comforting) and she'll ask him to locate Bates. In short order, Mary tells Anna he is indeed working at the Red Lyon pub in the village. Anna can't understand why Bates, who has admitted to problems with drink in the past, would be working in a pub. Don't be dense! "It's what you do with the information," Mary tells her. So Anna goes off to see Bates. "I don't know if I dreaded this moment or longed for it," he tells her when she steps up to his bar amd orders a glass of cider. These are the moments that I love on this show! Bates tells her he has evidence that Vera has been unfaithful and that's grounds for divorce. Anna is so in love with Bates she doesn't want to wait for the divorce to be final to be with him. "It's not against the law to take a mistress, Mr. Bates," she tells him. (Isn't it time to call him John?) To which he replies: "I know you, Anna Smith, and that's not the right path for you." Dear Lord, please give these people a few hours of happiness before this whole thing is over. William, about to go off to war, asks Daisy to marry him. Mrs. Patmore had warned the girl this was coming and told her the only decent thing to do was to say yes even though the kitchen maid didn't share his feelings. I have a terrible feeling William is going to be Downton's first casualty. He's such a sweet, guileless soul so it's a pretty safe bet he won't make it through the entire series. Lang's shell shock is getting worse and the sight of all those officers proudly wearing their red uniforms is giving him night terrors about being sent back to the front. One night, his nigtmares wake the entire staff. Surprisingly, it's O'Brien that shows him the most compassion. Everyone else just tries their best to steer clear of him. Branson, an increasingly loose cannon whose political leanings make everyone nervous, tells Sybil he's enlisting so he can denounce the British military (who killed his Irish cousin with a bullet in the street because they thought he was a rebel). But you'll go to jail, says Sybil, clearly distressed by his decision. Yes, but I will have spoken my mind and I'll be alive. Branson's plans are thwarted when he fails the physical (it turns out he had a heart murmur). Then he finds another opportunity where he can make his political views known. When he learns there is to be a dinner at Downton for the general visiting with Matthew, he tells Carson he will stand in for Mr. Lang who clearly is no longer fit for service. Carson, who had fretted about serving the dinner without a footman, is relieved to have the help and tells Branson to find a livery. In the episode's best sequence, Anna finds Branson's note to Sybil saying he's sorry for what he's about to do. Thinking the worst, the house maid races through the house setting off a relay while we see Branson standing with his back to the group gathered in the dining room about to be served -- what? -- by the disgruntled chauffeur. With seconds to spare, Mr. Carson bursts into the dining room and forcibly removes Branson. Once back downstairs, he accuses him of trying to assassinate the general. That wasn't exactly what he had it mind -- he was just going to pour some cow pies and slop on his head. That will show 'em. At the last minute, sweet William in his military uniform steps in and receives praise from everyone at the table. Dinner goes on unaffected. But war lurks at every corner. When the general and his squadron are leaving, Lang joins the rest of staff at the front of the house as per Mr. Carson's instruction. Lang finally snaps and collapses into the arms of Lord Grantham begging not to be sent back to the front. Grantham uncomfortable with the emotional display ("Things can't be that bad, man!") hands the distraught Lang back to Carson who is finally forced to see that life at Downton will never be the same. That night, while preparing for bed, Lord Grantham offers his take to Lady Grantham on the events that have transpired: "The world was in a dream before the war but now it's woken up and said good-bye to it." Indeed.